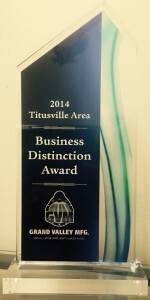 Grand Valley Manufacturing was awarded this year’s “Business of Distinction”. For over 65 years, GVM has been a solid, family owned business here in Titusville. With humble beginnings in 1942 as a small machine shop on Chestnut Street, to today operating 4 facilities that each provide specialized turning, boring, milling and drilling operations for their customers. GVM definitely fulfills the performance criteria for this award. GVM has invested in excess of $6 million dollars into machinery and equipment within the last few years allowing for continued expansions and has fostered relationship with major national and international customers. Demonstrates success through revenue growth, increased employment, increased clients, or through business expansion. Demonstrates success through innovative products or services. Demonstrates solid commitment through economic support to the Titusville community.